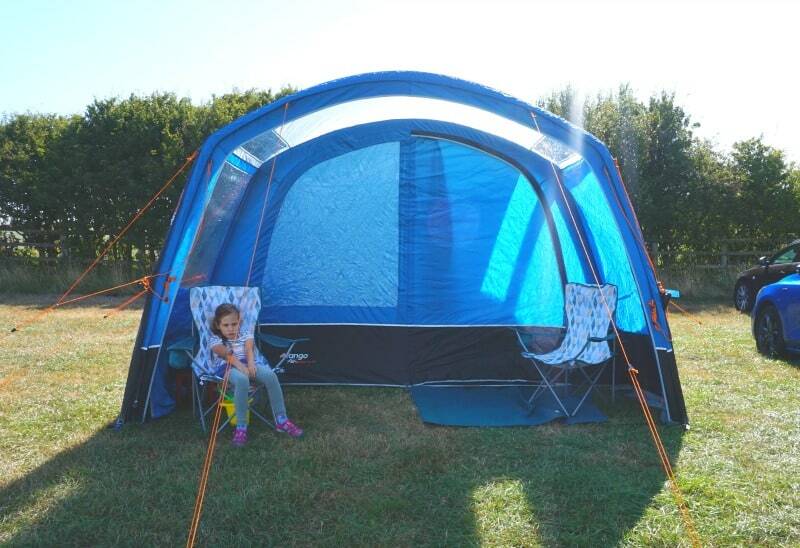 Vango Edoras 500XL Air REVIEW – The Perfect Family Tent? Over the summer we were asked to review the Vango Edoras 500XL Air tent for the blog. 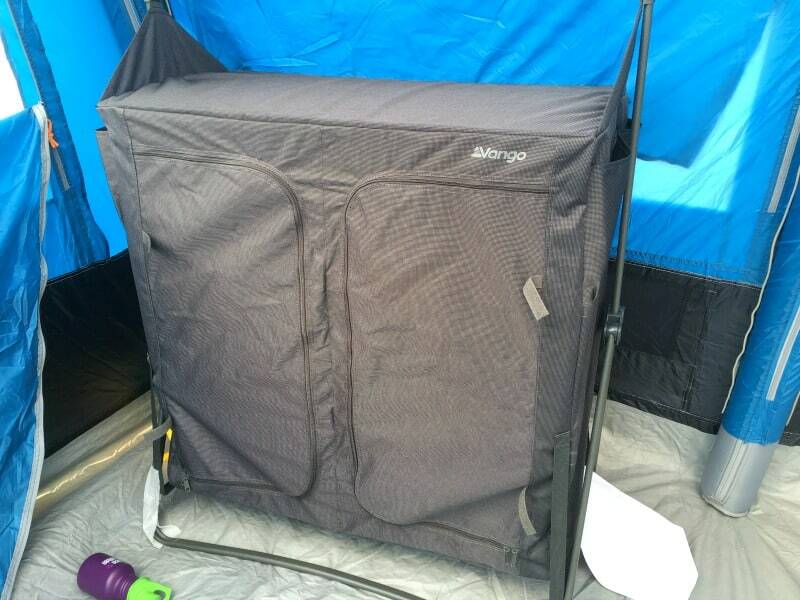 We set ourselves the task of finding out if this was the best Vango tent for family camping? It was the perfect excuse to book a family camping trip to North Yorkshire and test out the Vango Airbeam tent, so we packed up our gear and off we went. The girls were really excited about their camping trip. They love being outdoors and having the freedom that comes with it. As parents we find a camping holiday a little more effort but the benefits completely outweigh the challenges it brings us. Having a good family tent for us means being able to fit in a few more holidays a year and having the opportunity to visit places we perhaps wouldn’t have made it too. My dream is to take the family camping in France or Spain, firstly because the weather there lends itself to camping so well and secondly because they have such fantastic campsites in Europe with great facilities. The first thing to mention about the Vango Edoras 500xl Air is that it’s quite large and heavy when it’s rolled up and in the bag. It’s not really a criticism of the Vango inflatable tent, just more something you need to bear in mind. You will need a large boot space to transport it and the camping equipment you are taking on holiday. You will also want to think about where you store your Vango airbeam tent while you are not using it. When we arrived in North Yorkshire it was actually hailing. After that crazy heatwave we had had we really felt like we had drawn the short straw. The wind was pretty strong too so we looked for a place to pitch the inflatable tent that felt sheltered from the elements a little at least. It felt we had been given the perfect conditions to put our Vango Edoras 500XL Air to the test, but how did it fair? We saw a break in the weather and decided we just had to go for it. The great thing about the Vango Edoras 500XL Air is it is really quick to pitch. We rolled out the tent and got it pegged out in a few minutes. This Vango inflatable tent comes with pegs and a pump which is super handy. We used this to pump up the 5 Airbeam poles. We had each pole inflated on our Vango 5 man tent in just a few minutes. The great thing about being able to get the tent up quickly and securely was that we were able to focus on getting the rest of the tent organised. When air beds need pumping and you need to arrange your camping kitchen, being able to save time on pitching the tent helps no end, especially on a family camping trip. Did the Tent Have Enough Living Space? 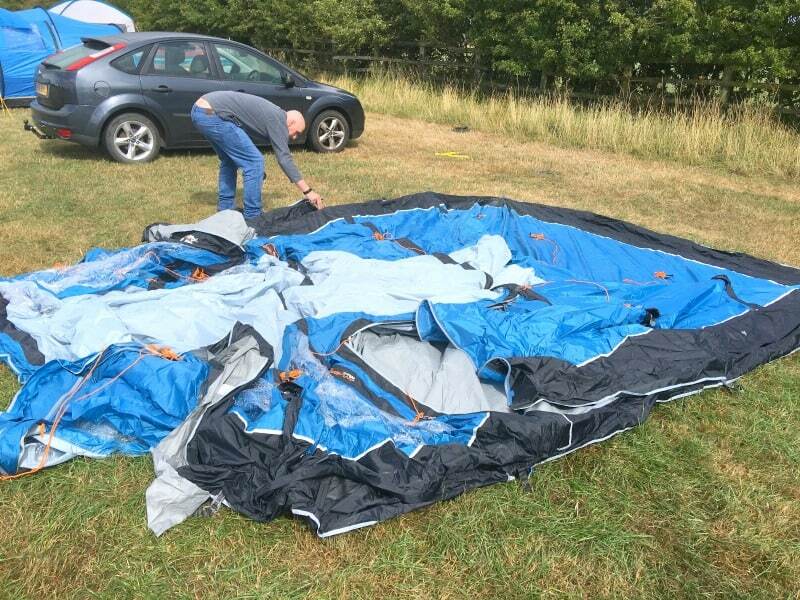 When the Vango Edoras 500XL tent was pitched we were really impressed with the size as well as quality. Vango make great quality tents, and we saw this previously in our Vango Beta 450XL review as well. 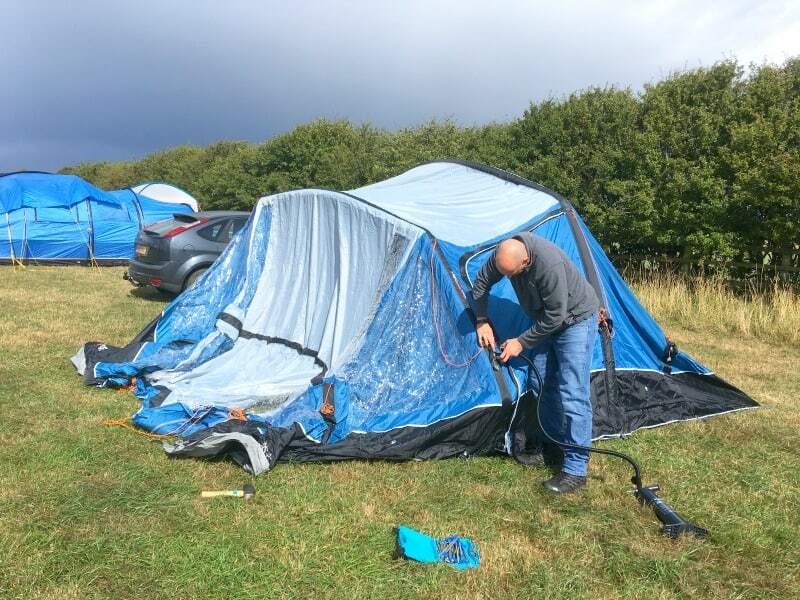 I wondered whether an airbeam tent would feel sturdy when it was pitched, but it was great even when the weather was a little on the feisty side. The Airbeam poles feel solid, and when they are pitched it doesn’t really dawn on you that they are filled with air. You can adjust the Vango tent in a few places for additional security. 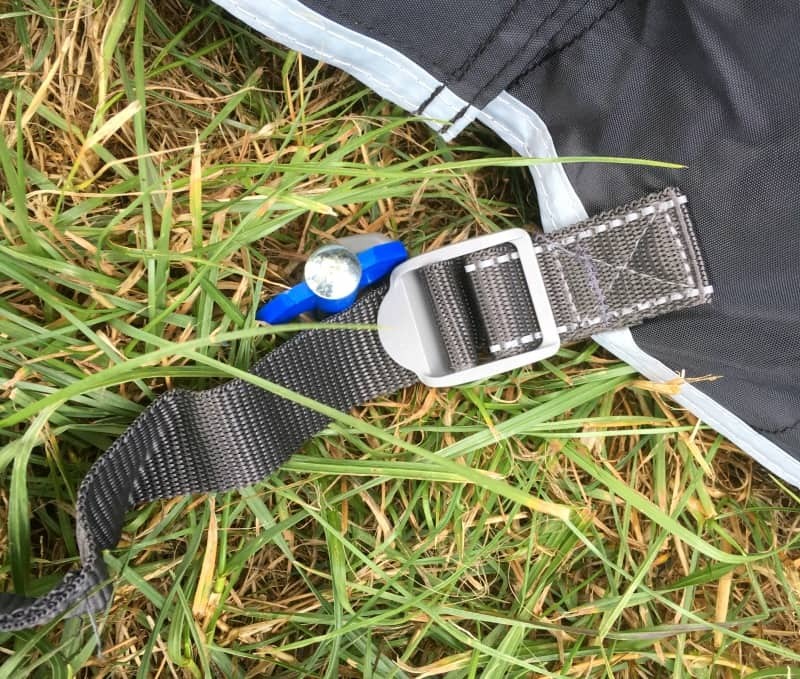 The tent peg straps, the guylines and the internal straps can all be adjusted to secure the tent further and to help prevent bending in extreme weather conditions. We definitely noticed that our tent faired well against other traditional designs that were pitched in the camping field. The space that the Vango Edoras 500XL 5 man tent created for us a family was perfect. Inside we had 2 good sized bedrooms, a huge living space which we could move around in freely, and a front porch that gave us somewhere to sit outside when needed. With lots of camping sites charging extra if you want to pitch a gazebo with a tent, this felt like a great extra to have included on a family tent. 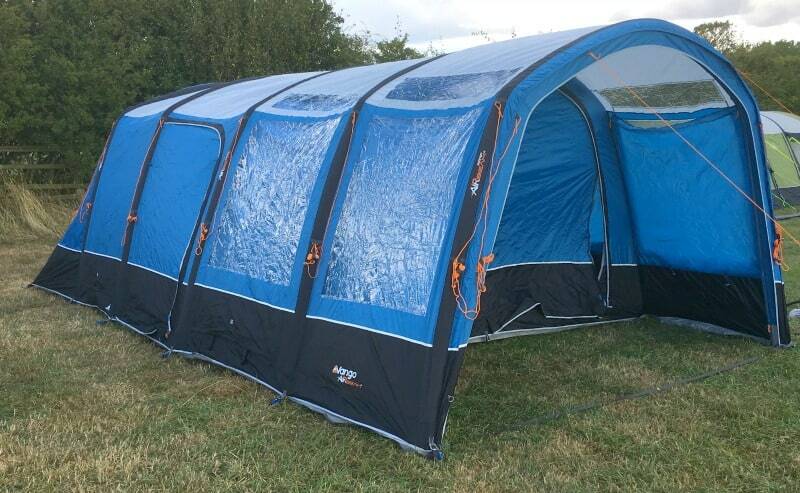 I also really felt like this would make a perfect tent for taking on holiday to Europe because it was so well ventilated and had lots of doors and windows. There was a door on each side and to the front of the tent. Each door has a mesh vent to prevent bugs getting in. The windows in the tent and the front extension all had zipped privacy curtains so you could have as much or as little privacy as you needed at any time of day or night. The bathtub ground sheet inside the Vango airbeam tents is really excellent quality too and I feel it could withstand anything that a family of 4 or 5 threw at it. We put a few picnic rugs down in the evening and closed up the tent so the girls could settle for bed. We felt cosy warm inside and were quite happy playing games and reading stories until bedtime. As well as the Vango inflatable tent we also had the opportunity to review the super cosy Vango Aurora double sleeping bags. For sleeping these were just great. They are soft and fleecy inside and really warm when the temperature is dropping at night. They are a 3 season sleeping bag with 2 pillow cases provided. The zips are excellent quality and perfect for securing wriggly little people inside them. The only thing to mention is that being a super snuggly warm double sleeping bag they are quite big to store and transport so you might want to bear that in mind. I’m always mindful that you should only take camping equipment on a trip that is necessary and useful. One of the ways that I keep our family organised on any kind of holiday is to unpack our gear straight away. During the holiday I throw all the dirty laundry back in the rucksack or suitcase so that packing to leave isn’t so much of a chore. For this reason we took the Vango Mammoth Double 2 Storage Unit and it turned out to be a really useful piece of camping equipment. It only took a few minutes to assemble and provided us with 6 shelves and additional side pockets to put our clothes in. The top of the unit also became somewhere to put things we needed to store too. What this helped us to achieve inside the tent was a relatively clear floor space to make the most of the room we had inside the tent. It helped us stay organised and clutter free which was great. I thought it was a given that there would always be stuff all over the tent, but this shelf unit is ideal if you like to keep your living space clear. Combined with the pockets inside the tent and bedroom we had lots of storage space inside the Vango Edoras 500XL 5 man tent. The last piece of camping kit I wanted to mention is the Vango Stryd 26 rucksack. We used this throughout our camping trip and I’ve also used it on lots of days out with the kids since. 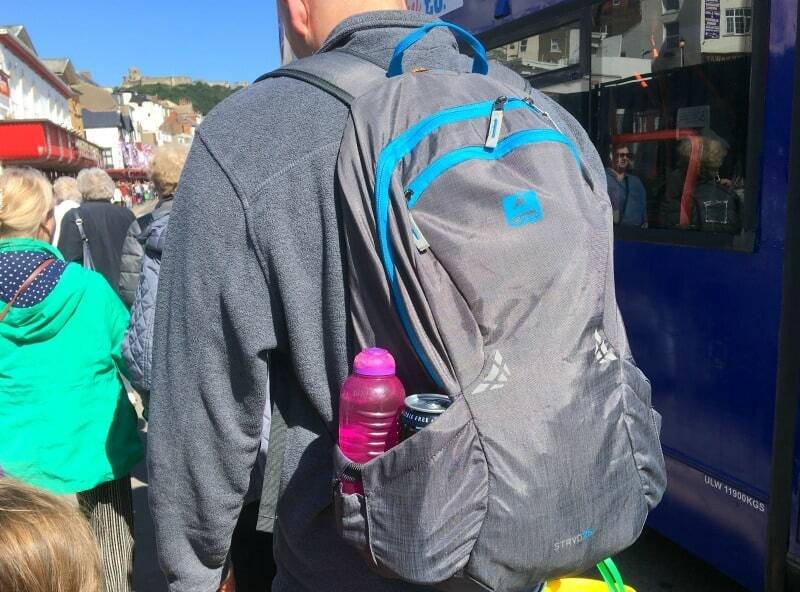 The 2 side pockets on this rucksack are really generous and provide lots of room for drinks and suncream to be kept. We were also able to fill the inside of the rucksack with snacks, wipes and spare clothes when we were visiting the beach or out for the day with the girls. There’s a small internal pocket which is handy for tissues, wallets and phones so you can keep everything in one place. So firstly if you are wondering if Vango tents are any good I honestly think the answer is yes. Vango make great quality tents and camping equipment especially for families. 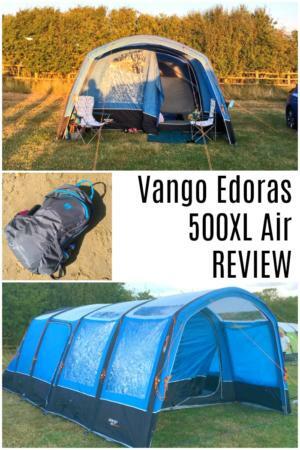 This experience with the Vango Edoras 500XL and our previous review of the Vango Beta 450XL has really confirmed that for us. The Vango Edoras 500XL is a great tent to invest in if you are planning on doing more camping with the family. I am convinced we are going to be using this airbeam tent for many years to come both here in the UK and hopefully further afield because it provides great living space and comfort for a camping holiday. I would also strongly recommend talking a look at the Vango Mammoth Double 2 Storage Unit and the Aurora double sleeping bags especially if you are a fan of your creature comforts and tidy spaces. The Vango Stryd 26 rucksack is also great for camping and day trips and will get a lot of use if you are a family who likes to get out and about all year round. We were provided with the Vango Edoras 500XL Air 5 man tent and additional camping equipment for the purposes of this review but all thoughts and opinions are our own. If you found this post useful please do share it with your friends or followers or Pin It to your favourite Pinterest board! It would literally make my day. It looks vast, and if it’s relatively easy to put up and take down, then that’s a real plus. We haven’t yet been camping as a family but have started looking at a few tents because it’s definitely something we want to do in spring next year. This tent looks brilliant! What a brilliant tent and I love how easy it looks to put up. We’ve just started to go camping as a family and need to invest in a bigger tent now the girls are older. I’ll take a look at this one! What a great looking tent. I really like the size. That sounds like an awesome tent. We had a Vango tent in the UK, albeit a traditional poles one, but it was amazing and stood the test against some rough weather in the Isle of Man one year. It was us humans who gave up before the tent did! We have a Vango air awning for our caravan – it’s amazing how quickly you can set it up! What used to take two people ages, now takes one person less than 15 mins from start to finish. I’ve never owned a tent though! This tent looks really great for families! I love the space that it offers Zena. It will surely give the comfort that you need even if you’re away from home. Camping is something I am yet to do and this post just makes me look that much more forward to it! It seems like an amazing experience!